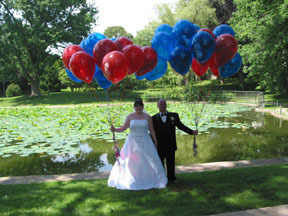 Wilcox Park is available for wedding ceremonies, photo sessions, picnics, etc… A Park Use Application is required for wedding ceremonies and other events that might require park staff. This form is available online, at the circulation desk in the library or by postal mail. A fee is required for wedding ceremonies. The Park Use Guidelines form outlines the rules users must comply with. Wedding photos do not require a fee or form, but it is advised to call the Park Superintendent to check on possible conflicting events. In general, vehicles, alcohol and fires are not allowed in the park. Electrical amplification of voice or music is not allowed unless done with a battery-powered device. Private use of the Park is to be done without disrupting the enjoyment of the Park by others. Walkways must be kept unobstructed. Live acoustical music as well as horse-drawn carriages are welcome.